This past week, while enjoying one of our favorite cities in the world, Porto, it occurred to us that we were harboring a delicious secret that should be revealed. This cuisine, though not entirely secret to the entire population of Brazil, is unknown to many, and it’s called Churrasqueira (Churrascaria is Brazilian). Last Sunday, while scouring the internet for cheap meal that would satiate the belly, we eventually asked the front desk for a little assistance. Unfortunately, the hotel attendent was less that enthusiastic about our chances to find anything interesting, as we were not only in the “touristy” section of the city, but it was also Sunday night. Having stumbled across a place called Churrasqueira Brasa online, located just down the road from the hotel, the attendent smiled and said, “we don’t usually send guests there, because it’s rarely what they are expecting”, ruling it out as a “bit too local”. Hey, we feel like we’re locals, at least in our own minds, and knowing that we just needed something simple, we headed straight over. Having been to Churrasqueiras on several occasions, we were very savvy as to what we were getting, and it was absolutely perfect. After a short walk down windy and oddly cold streets – what’s up with July in Porto – we arrived at the front entrance of a casual neighborhood joint. So rather than regale you with our meal, let me give you some tips on how to order and what to get. Local Churrasqueirs are everywhere in Portugal and they are worth visiting for local fare. Don’t worry about the pricing, it’s cheap. Order conservatively. Most places will offer 1/2 and full “Doses”. If you’re alone, order 1/2. A half order is a TON of food, and often, it’s fine for 2 people, though you might need a full plate for 2 very hungry people. Stick to Beer, or maybe a house wine. Don’t expect good wine service and don’t demand it. Your carafe of house wine will be simple and very drinkable. If your not craving quaffable wine, order beer. “Uma Cerveja Por Favor”. If you like vegetables, order a salad, or as I like to call it: A plate of lettuce with slices of tomato, and if you’re lucky, an onion. If you pay more than 3 euros for this, then you are not in a “local’s hangout”! When you start the meal, the waiter will typically throw down little tins of pate, butter, olives, and other nibbles. You will be charged for this, and can refuse it, but seriously, it’s like 2€’s per person, dig in! Our recent expedition allotted us 3 of the juiciest sausages I’ve had in a long time, a true treat. Enjoy the “Couvert“. If you want fish, ask for what is fresh or for the “peixe do dia“. This can often be the best choice, and if you’re near the coast, you’ll experience something very special! And if you’re really lucky, they just might even grill up some Octopus (a must try!). Otherwise, order MEAT. Secretos de porco (Brazil: Segredos de Porco) is a secret we’re not giving away other than to say it’s Black-footed pig belly meat. Personally, this is always a winner. 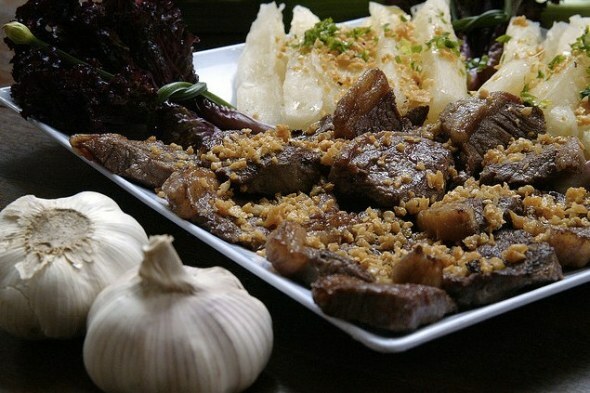 Pichana (Brazil: Picanha) on the other hand is usually slices of fat backed meat that is rich and juicy, and full of flavor. Both are well worth the trip to any Churrasqueira. To accompany these dishes, you’ll typically receive either potatoes and some lettuce, or sometimes you’ll luck out and get some black beans and rice. You never know, well unless you speak Portuguese and can ask, but personally I love the mystery! Finally, chicken. Most people skip the chicken because it’s supposed pedestrian nature, but we know better. Frango (like the little mints, but chicken flavored!) is roasted to perfection and always moist, generally served with potatoes and other fixings. If you’re looking for a safe bet, this will never disappoint. I could go on with several more tips, but I’d rather encourage my Portuguese and Brazilian friends to fill out the comments below with more tips that I’ve either missed or have forgotten. The key here is cheap. You can eat until at infinitum for 10€’s, and sometimes less. If you’re looking at paying more than 10€’s after you see the menu, I would suggest moving checking out another location. Let us know if you have a favorite one, or a place you like to go, we’d love to check out next time we’re in town!